When it comes to comfort food, it takes me back to my childhood, as my Auntie Marianne from Sweden would prepare for us, serving it with homemade potato puree. When she graciously passed her recipe on to me, I kept the potato puree tradition, a flavour that always takes me back to childhood. Buttered tagliatelle also enhances the delicate flavour of the meatballs. 1. 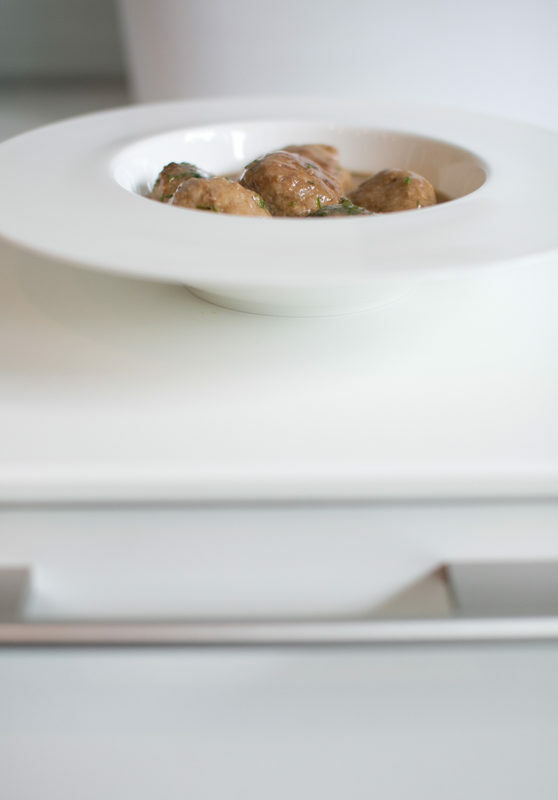 For the meatballs: Preheat the oven to 130℃ (265℉). 2. Using your hands combine the beef, pork, onion, salt, pepper, spices, heavy cream, egg and breadcrumbs. Shape into 4 cm round balls. On a rimmed baking sheet place them in the freezer for 30 minutes. 3. In a large, non-stick frying pan heat the butter over a medium heat. Cook the meatballs—shaking the pan occasionally to prevent sticking—until browned and cooked throughout, about 6 minutes. 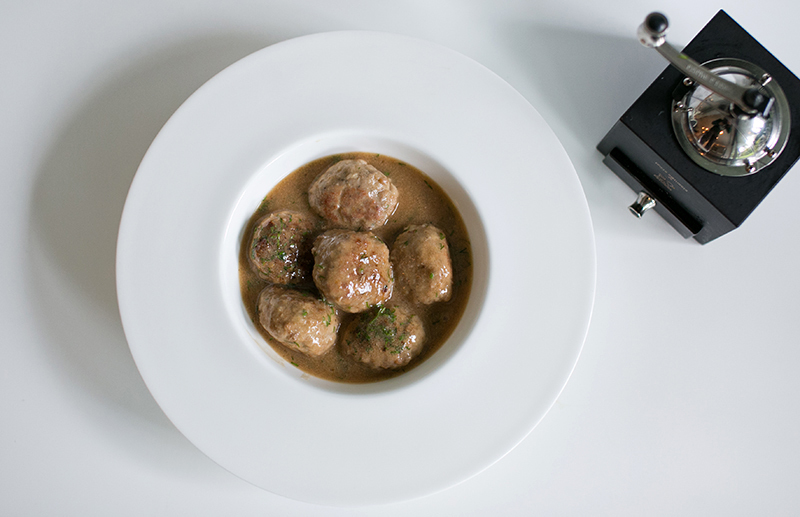 Place in a deep baking dish and keep the cooked meatballs warm in the oven while preparing the sauce. 4. For the sauce: Pour out the fat and brown bits from the frying pan. Add the butter and sauté the chopped onions until soft and golden. Add the wine and cook over a medium heat, stirring, until mostly reduced. Whisk in the sour cream stock and Worcestershire sauce . Raise the heat to medium high, and simmer, stirring, until thick; about 8 to 10 minutes. Pour through a sieve so the sauce becomes smooth and velvety creamy gravy. 5. 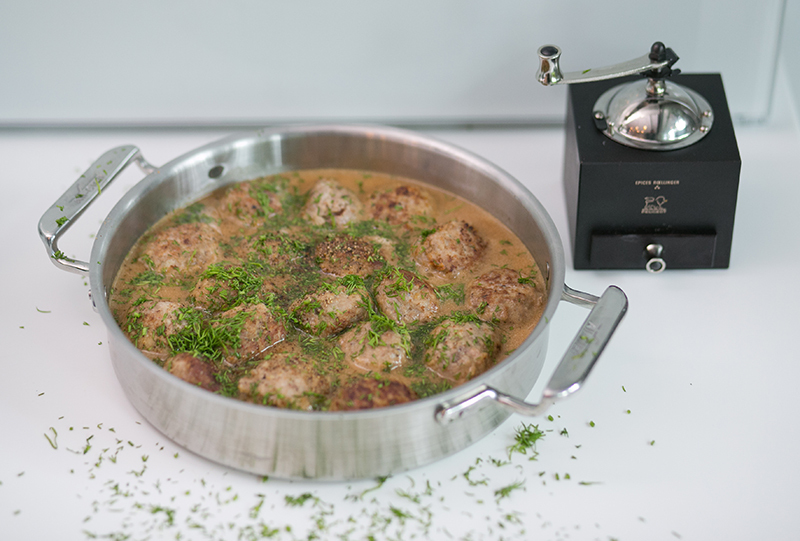 Top the meatballs with the sauce and sprinkle with freshly chopped dill and season to taste. 6. Serve warm accompanied by fresh potato puree or buttered tagliatelle.